I have received four more postcards since I last posted! This touch of Spring comes from Scotland by Ailsa Mackay. 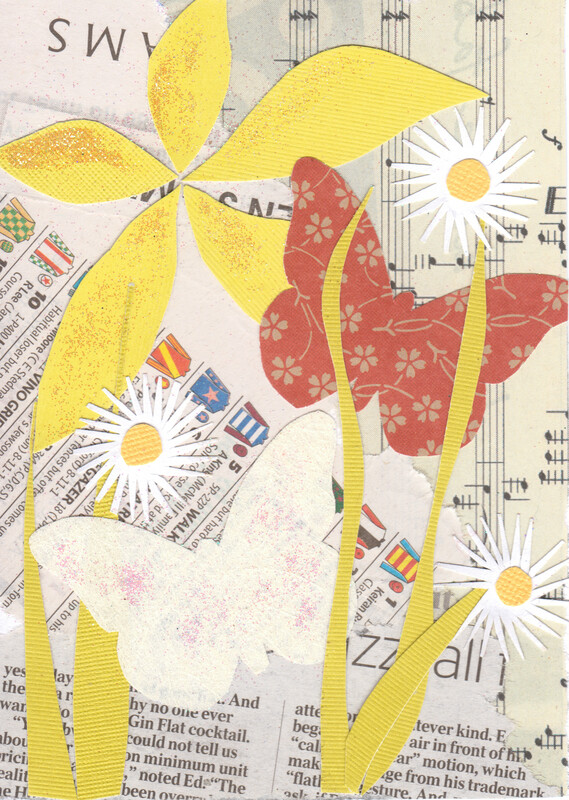 Ailsa’s piece contains many of my favorite things – butterflies, daisies, and music. I love the inclusion of the different flags from all over. They add a beautiful pop of colour, plus an homage to the international community sending postcards all over. 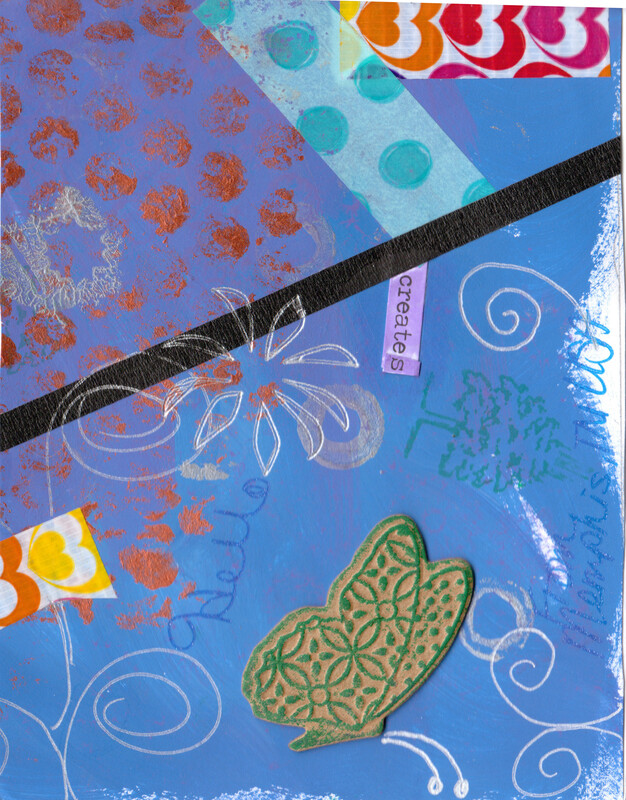 Titled “Creates,” this piece comes from Tricia in Memphis. We have another appearance of butterflies! I love the rainbow of color throughout, tied together with the tape. 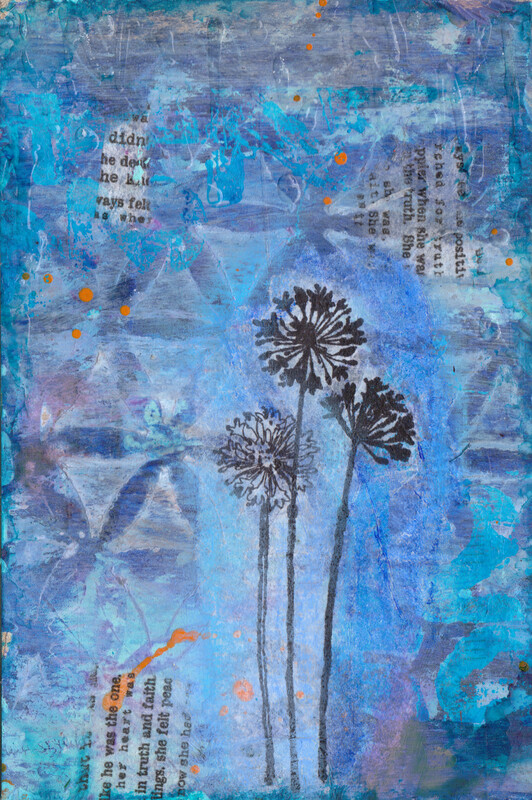 My favorite part is that Tricia writes that this is made from “Acrylic, Tape, Ink, Love.” The best art is heartfelt! Violette sent this postcard from Denver. I am truly in awe of her artistic ability. I love the dresses, the sweet faces. 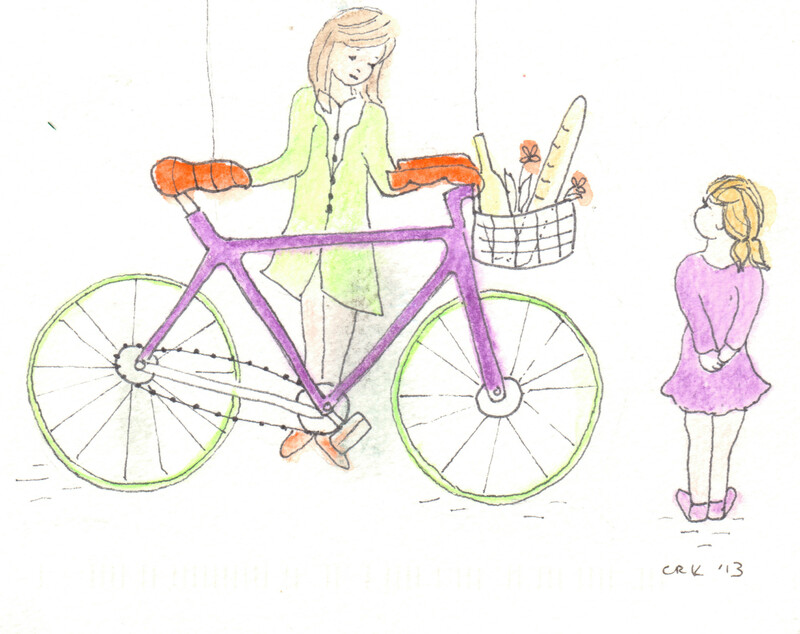 Maybe these two are on their way to a picnic. Or are returning from a trip to the local market. You should check out Violette’s website. Her art is divine! I feel lucky to have my own sweet drawing from her! My last treasure thus far comes from Tina in Maryland. I love the snippets of words highlighted and the layers of blues. The orange sneaks in there, complementary. At the top of the piece are some dribbles of a glossy glue (maybe?) which adds a very interesting effect. It’s hard to see it on the scan, but it almost looks like rain. I think the flowers might be dandelions. Our dandelions don’t make an appearance here in Upstate Western New York State, USA, until June. This will have to tide me over until I can see them for myself! I love heading to the mailbox each day to see if another treasure has arrived. A special thank you to Ailsa, Tricia, Tina and Violette! I loved making my cards so it seemed only natural to include some love in them.